Bees are responsible for one out of three bites of food we eat — and Crown Bees works to safeguard the planet’s future food supply by increasing the population of native bees in North America. Although the plight of the honey bee has been well publicized, many people are unaware that there are more than 4,000 other species of bees. These native bees can work side-by-side with honey bees to pollinate home gardens as well as major food crops such as cherries and almonds. Crown Bees, in Seattle, Washington, is on a mission to increase public awareness about native bees and to build a network of “Bee Boosters” – concerned citizens who raise, harvest and share millions of gentle bees in their backyards, communities and farms. This grassroots approach helps supply the millions of managed bees needed to meet future commercial food pollination. Bee Booster can raise mason bees inexpensively while increasing their own garden yields. Crown Bees provides support with tips for success and affordable bee-safe products. At the end of the season, Bee Boosters can trade excess cocoons for free supplies or cash through the company’s unique Bee BuyBack program. Cocoons sent back to Crown Bees are then sorted and distributed in the same local region where the bees were raised. While honey bees may be the best known and widely managed pollinators, gentle solitary bees can also bring food to the table – and they rarely sting. Native bees do not make honey – their only job is to pollinate fruits, vegetables, nuts and flowers. According to Hunter, an increased population of native bees is a key answer to the troubled honey bees. These gentle food-making bees are super pollinators. For more information about Crown Bees or to join the Bee Booster network, visit crownbees.com. 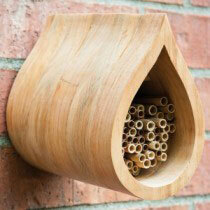 Crown Bees is a leading provider of solitary and native bees along with bee-safe nesting products. Serving the retail and commercial markets since 2008, Crown Bees has focused on supplementing the declining honey bee population. Its unique Bee Buyback program helps gardeners complete the bee harvesting circle in an easy and efficient way. Find out more at www.CrownBees.com.